The Defense Ministry here claimed Wednesday that the North appears to have improved its capacity to miniaturize nuclear warheads so they can be fitted on to missiles. The nuclear payload needs to be reduced to less than 1,000 kg and the diameter to less than 90 cm to fit on a missile. The ministry based its claim on assessment from South Korean and U.S. intelligence services. Technical people can chime in about whether the measurements and numbers are accurate. But if this is accurate, it is alarming and troubling. I’ve written many times on this site about how I think the threat the US (as well of course as the threat to South Korea and Japan) faces from North Korea’s nuclear ambitions and general nuttiness, far outstrips whatever potential threat the US may one day possibly face if Iran maybe possibly produces a nuclear weapon. But in terms of general concern by the US government, and “doing something” about the North Korean nuclear threat, I don’t see a whole lot happening. Certainly there’s less attention being paid to it by the US administration and by Congress than is paid to the Iran issue. I think this is a seriously misplaced emphasis, and I hope we don’t pay a price for it. I often criticize US officials when they say that Iran’s possession of a nuclear weapon is unacceptable. Of course, in the case of NK we are way beyond that point now. NK has nuclear weapons, we know that. And we know they have long range missiles capable, or nearly capable, of reaching the US. It is only a matter of time before they progress development of both, and put the two together to have a weapon capable of striking both Japan and the US. Also unlike the Iranian case, I have no confidence – zero – in the rationality and prudence of decisionmaking by NK officials. I think they are incredibly unpredictable, and are just genuinely nuts. This regime possessing nuclear weapons capable of striking Japan or the US is, in my opinion, absolutely unacceptable. What do I mean by that? I’m still trying to think it through. I know what an ugly mess it would be to actually engage in military force against North Korea to forcibly disarm it of its nuclear weapons stockpile, and stop its development programs. I know the proximity of Seoul, and the presence of thousands of US troops around the DMZ. My uncle and his family live in Seoul. So it’s not something that I would want done unless absolutely necessary. I’m not a military planner, so I don’t know exactly how it would all work out. But I’m sure there are no good options for such a campaign. But on the other hand, I do not want to live in a world in which North Korea has nuclear weapons deliverable at its psychotic whim against the US. Again, this isn’t Iraq 2003. This isn’t Iran 2013. This is a country that we know has nuclear weapons, and that we know is closing in on the capacity to deliver them against the US. And the rhetoric, whether to be believed 100% or not, is just not something I think we can ignore. Where, then, is the “red line” here? Where is the point at which it will be necessary for the US and South Korea to take the extreme step of preemptively attacking North Korea? I don’t know, but I think it’s coming soon. And if/when it does, I think it will be both legal under international law, and morally justifiable. I agree with Julian Ku’s legal analysis generally, and while of course the principles of the jus in bello would have to additionally be met (most importantly proportionality and discrimination), I think North Korea presents the strongest case we have ever seen for the satisfaction of the Caroline criteria for anticipatory self-defense in the jus ad bellum. In this case I unfortunately see few other realistic options. UPDATE: Friend of ACL and actual nuclear weapons expert Bob Kelley wrote a piece in Jane’s a few months ago that takes a different view of the NK miniaturization issue, and importantly sounds a note of caution about exaggerating claims on the basis of few known facts concerning the NK NW program. I’ll attach his article below. I’ll defer to Bob’s technical assessment any day. Excellent points made by a commenter to my last post. So please belay/ignore my last post. I was just reading over India’s and Pakistan’s respective declarations recognizing the compulsory jurisdiction of the ICJ. You can find them here and here. In both documents, there is an express exception to jurisdiction, relating to disputes concerning multilateral treaties, which of course includes the NPT. ii) the Government of Pakistan specially agree to jurisdiction; and provided further, that this Declaration shall remain in force till such time as notice may be given to terminate it. You could try to draw some semantic distinctions between them, but ultimately I think they are saying the same thing, which is that India and Pakistan respectively, only consent to be a party in a case before the ICJ involving a dispute concerning a multilateral treaty, when all the other parties to the multilateral treaty are also parties to the case. Assuming that is the correct interpretation of this jurisdictional exception, then India and Pakistan can probably persuasively argue that the ICJ cannot exercise jurisdiction over the suits brought against them by the Marshall Islands. That would leave the UK as the only state that would have to concede ICJ jurisdiction over the case against it, unless the FCO has some trick up its sleeve that I don’t know about! You can read the UK’s declaration here. I don’t see any similarly helpful exceptions to jurisdiction. Marshall Islands Brings Lawsuits Against All Nine Nuclear Weapons Possessing States in the International Court of Justice!!! Wow!!! I just learned about this this morning. Apparently the cases were filed this morning with the ICJ. See the Guardian news story here. Here then are the legal documents themselves that have been filed, both in the ICJ and in US Federal Court. I’m still looking through the documents, but it appears that the RMI has brought suit against all five NPT NWS, plus India, Pakistan, Israel, and North Korea, basically arguing that they are in violation of the NPT Article VI obligation to disarm. With regard to the non-NPT parties (India, Pakistan, Israel, NK) the memorials argue that the obligation in Article VI has passed into customary international law and is thus binding on all states. Wow. I’m sure there will be much more to say about all this – I’ve been a bit blindsided by it. But at first blush, I would note a couple of things about the jurisdiction of the ICJ. Of the states who are respondents in these actions at the ICJ only three of them – the U.K., Pakistan, and India – have accepted the compulsory jurisdiction of the ICJ. That means that the cases against the U.K., Pakistan, and India should be able to go forward procedurally. For all of the other states, including the U.S., for the ICJ to be able to exercise jurisdiction, the respondent state will have to give its ad hoc consent for the case to go forward. I’d say there’s just about zero chance that this will happen in any of the other actions. So at least on my first read through of the materials, it would appear that the three viable cases before the ICJ are the cases against the U.K., Pakistan, and India. That’s all I’ll say for now. More to come!! Yesterday I was privileged to visit Plant Farley, a nuclear power plant located near Dothan in south Alabama. The plant staff arranged for an extremely interesting and informational tour for us, and were very gracious hosts. This was my first time actually visiting a nuclear power plant, and it helped alot to see the technology in action. Farley is a two-unit Westinghouse pressurized water reactor, so the most common type of reactor employed in the US. I got to talk to several of the operating staff and engineers and learned alot. It brought together, and filled some gaps in, all of the stuff I’ve read about nuclear power plants. It was thrilling to see the various parts of the complex in person – the cooling towers, the turbines, the control room, the diesel backup generators, the dry cask storage units for spent fuel. And they had useful models of a fuel assembly and the reactor core. Part of the tour was the replica control room, an exact model of the actual control room used for training of operators. 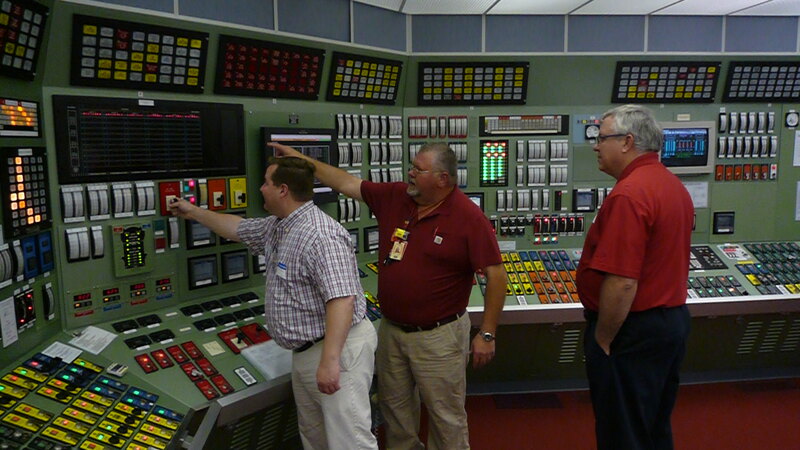 Here’s a picture of me “tripping” the reactor (at the direction of supervisor Randy Odom). As soon as I flipped the switch, the LED lights (above my hand) indicating the position of the control rods inside the core came down withing three seconds, indicating the control rods descending in between the fuel rods in the core and stopping the fission reaction. A really neat experience. A Resolution of the PMD Issue? Iran said on Monday it was drafting a comprehensive account of its nuclear activities, but did not indicate whether this would be made available to help the final diplomatic push to resolve a decade-old dispute with the West over the program. The move could meet Western demands for greater transparency to address concerns that Iran may have been trying to develop a nuclear weapons capability, but Behrouz Kamalvandi, spokesman for Iran’s atomic energy agency, made no mention of this. “There are various files on our atomic program, but we’re lacking a comprehensive document, which we are writing now,” the official IRNA news agency quoted Kamalvandi as saying. Could the motivation for compiling this report be to then present it to the IAEA, in order to constitute Iran’s formal answer to the IAEA’s queries about past possible military dimensions to Iran’s nuclear program? As I’ve noted before, there seems to be a welcome air of pragmatism in some circles about de-emphasizing the PMD issue, and facilitating its resolution, as part of a comprehensive deal between Iran and the P5+1/IAEA. The production of this report by Iran may be the first coordinated movement in that kabuki play, after which the IAEA and the West will, after some respectable time spent reviewing it, and possibly in concert with an additional coordinated inspection or two inside Iran, possibly at Parchin, declare that the report by Iran satisfactorily answers the IAEA questions. This then would be an extremely important step towards both sides being able to move past the PMD issue while saving face. The IAEA and UNSC demanded answers. Iran gave the answers. There was in the end no military dimension determined. Case closed. Along with a resolution of the other facets of the negotiations – e.g. importantly the recent progress being made on the Arak issue – this could pave the way for the UNSC to pass a new resolution supplanting its prior resolutions and lifting its order that Iran cease uranium enrichment, and further and most importantly, lifting its sanctions on Iran.